The French approach to salad greens ("mesclun" means "mixture"). 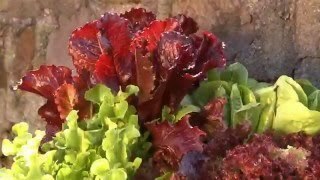 Sweet lettuces and tangy, tender greens are pre-mixed in just the right proportions as you pick them from your garden. This classic mesclun is a feast for the eyes and a gourmet treat. It includes arugula, chervil, endive, mache, four lettuces (Oak Leaf, Prizeleaf, Red Salad Bowl, Green Ice), radicchio and upland cress. Grows best in cool weather and full sun to partial shade. We searched the world to find the best organic seed-Burpee fully guarantees that not a drop of synthetic chemicals was used to make these excellent seeds. Certified Organic Seed. Mesclun, Classic Mix Organic is rated 2.8 out of 5 by 4. 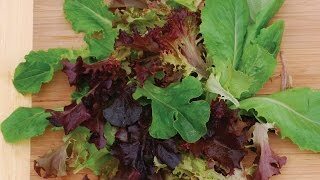 Rated 5 out of 5 by Glenn from All-time favorite mesclun I have been growing mesclun for 20 years and just tried this mix last year. It is after one year (and 3 plantings) my all-time favorite mesclun mix. I grow it early in the year, through the summer and now well into early winter. It definately does best in spring or fall. I planted a raised bed with the classic mix in mid-August and we're still harvesting it in late November. Before the first frost I covered it with hoops and clear plastic. Last night it was down to 17 F, but the mesclun is fine. It should go to about Christmas. I love the mix of flavor , texture, and color in the classic mix. It's my wife and daughter's favorite mix as well. Had no trouble with germination. Some members of the mix take longer to germinate than others, but it all came up and we were harvesting after about 4 weeks. This is a very productive mix and the arugala is a particularly nice large leafed variety. Rated 4 out of 5 by Shirlz from Yummy Salads! This is the third year I've been growing this stuff and I love it! When it's growing well I have more salad greens than I know what to do with - often give bunches away to family. Love that it's organic too!